There’s really nothing that makes us happier than Plex being made available on more devices (well, except maybe a nice cold micro-brew on a hot summer day). We love our Roku channel, Plex comes on every LG Smart TV sold, and an increasing number of DLNA devices can talk to our server as well. We’re happy to officially announce that you can now get Plex on your Samsung TV or Blu-ray player! 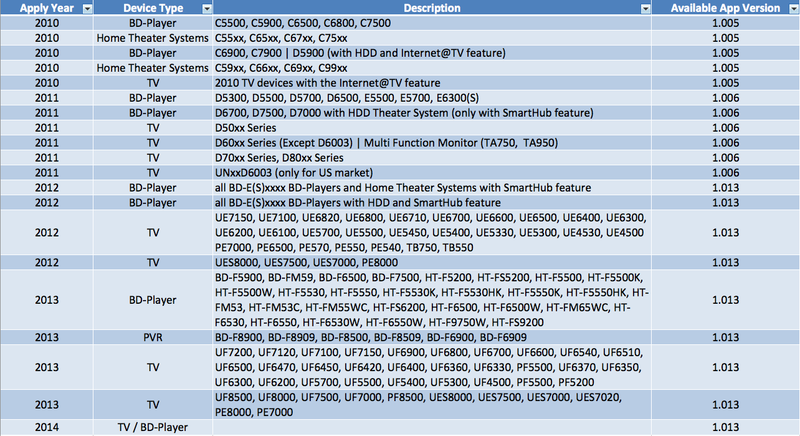 Most 2010 and 2011 models with Smart Hub are supported (check the full list), and 2012 models will be supported before too long. The app has been in development for a long time, and it used to rather complicated to install if you wanted to check it out, but now it’s available in the Samsung app store, so it’s just a few clicks away from being on your device. The app was developed primarily by hd1080, who first contacted me over a year ago. He’s been an incredible help during that time, suggesting improvements for our API, finding bugs, and just being an overall cool guy to hang out with (virtually, of course; this *is* the 21st century). He’s since been joined by the talented Orca, and between the two of them they’re making awesome progress in adding new features. The app is ridiculously good looking, and if you’re familiar with our Laika client, the interface is very close, which makes it the richest UI available on a device. In addition, there are other cool features, like native support for external SRT subtitles (without transcoding), and even 3D support. See more details here. The Samsung devices generally have excellent codec support as well. The Samsung client is a labor of love for the guys, and if you like it, I would highly encourage you to donate to their project. If you have a supported Samsung device, download the app and check it out, and let us know what you think! Welcoming Plex on Samsung is a premium feature and requires a Plex Pass subscription.